It’s time to believe in Bellez. A traditional ballet flat by Dajngo & Juliette with a twist, this is a shoe that wants to be the centre of attention thanks to its oversized hardware and leather rivet detailing. 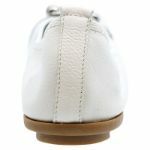 In super soft leather and with a comfort sole, these shoes have been thoughtfully designed with comfort in mind. Whether you wear them for work or at play, you’ll be able to walk in these all day.